After a short holiday in Apple Land, I had started to take Lightning for granted. Now with my purchase of a Nokia 6, I'm rediscovering my loathing for Micro-USB. 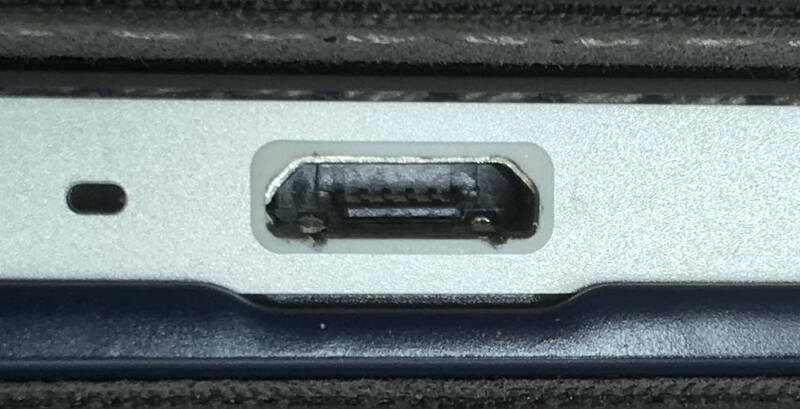 As with several Micro-USB phones I've had, the jack is not perfectly aligned with the hole in the body. It's only misaligned by a fraction of a millimeter, but it's enough that it would cause someone like my mother to not be able to insert the plug half of the time. If you try to insert the plug perfectly straight, it strikes the edge of the socket and won't go in. I can handle that, but I'm worried about the plastic rim around the inside of the hole. I inserted the plug 50 times to see how it would wear, and those stupid little hooks on the plug are cutting into the plastic. I'm worried that if they continue at that rate, part of the plastic rim will break out. I don't know how far into the phone it extends. At the moment (assuming the plastic is not going to fall apart), this seems like a trivial reason to return the phone. The phone has a flawless screen, so I'm extremely reluctant to gamble on that by returning the phone. The last thing I want to do is trade a misaligned port for backlight bleed etc. TL;DR: Internal USB port is off-center and as a result the plug is tearing into the plastic at an accelerated rate. Should I return the phone? I returned the phone and got one with a properly aligned port but a defective screen (TONS of pixel defects) just like I had feared. Now I'm on my third unit, and I'm back to square one because this unit has a misaligned port like the first one did. Will NOT be recommending Nokia Android phones to anyone after this. Your QC is a joke.